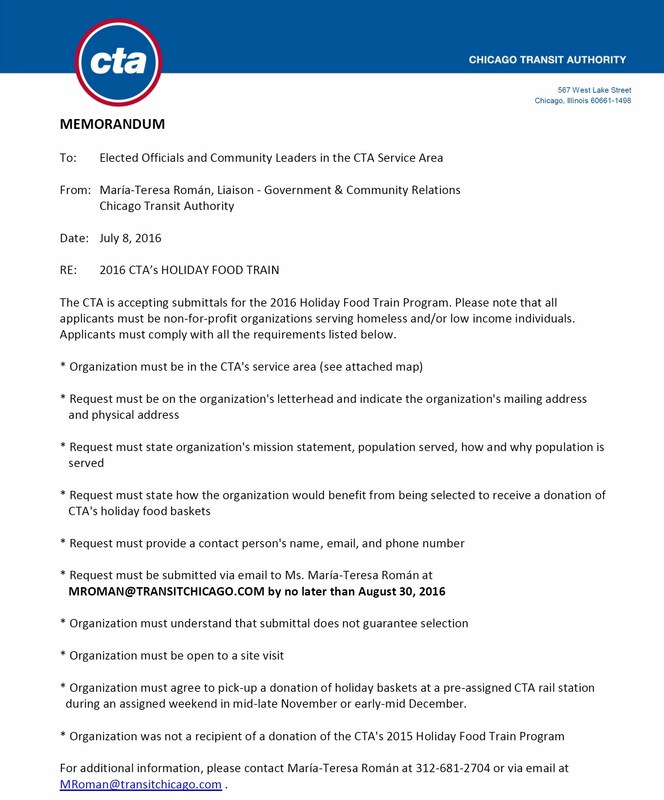 THE CHICAGO TRANSIT AUTHORITY IS ACCEPTING SUBMITTALS FOR THE 2016 HOLIDAY FOOD TRAIN PROGRAM. PLEASE NOTE THAT ALL APPLICANTS MUST BE NON-PROFIT ORGANIZATIONS SERVING HOMELESS AND/OR LOW-INCOME INDIVIDUALS. APPLICANTS MUST COMPLY WITH ALL THE REQUIREMENTS. FOR MORE INFORMATION, PLEASE CONTACT MARIA-TERESA ROMAN AT 312-681-2704 OR VIA EMAIL AT MROMAN@TRANSITCHICAGO.COM.